Stephen Keshi, Head coach of the Nigeria national team, has expressed worry over the recent injury picked up by Stoke City winger, Victor Moses. 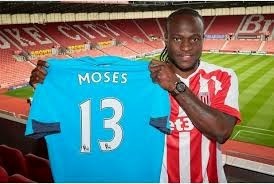 Moses pulled up injured in Stoke’s 1-3 defeat to Sunderland in the Barclays English Premier League on Saturday. He had provided the assist for Stoke’s solitary goal at the Stadium of Light, dispatched by Charlie Adam, before he was forced off with the injury. He is now a huge doubt for Nigeria’s 2015 Africa Cup of Nations (Afcon) qualifying double-header against Sudan. Speaking exclusively to supersport.com, Keshi expressed concern about the injury and expressed hope that it is not as serious as is feared in some quarters. “I was naturally worried to see him (Moses) get injured (on Saturday). He’s been in good form and I just hope that the injury is not that serious because we need him for those important games against Sudan,” Keshi said. Meanwhile the Stoke City manager, Mark Hughes says the extent of Moses’ injury is not yet clear. He suffered a recurrence of the tight thigh he injured in Monday’s win over Newcastle, but Hughes defended the decision to start the on-loan winger against the Black Cats. “Victor had a bit of tightness after the Newcastle game (on Monday). “But he felt discomfort and we weren’t going to take a risk. We are hoping it’s nothing serious, but given nothing showed on the scan we’ve got to get to the bottom of what’s causing it,” he said.